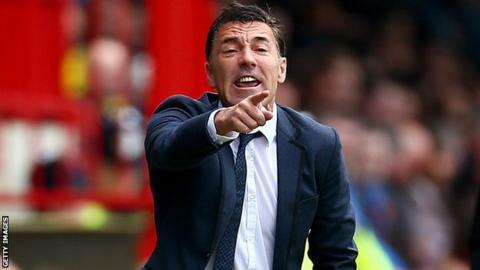 Chesterfield manager Dean Saunders has dismissed suggestions the club is in crisis after his side fell to a third straight loss at struggling Blackpool. Goals from Mark Cullen and Brad Potts gave the Seasiders their first home win in eight months, and extended the Spireites' winless run to five games. Tuesday's result leaves Chesterfield 17th in League One after 10 games, three points above the relegation zone. "We just need to pick some points up," Saunders told BBC Radio Sheffield. "On Saturday [a 2-1 home defeat by Burton], if the referee gives Jay O'Shea a penalty we're fifth I think in the league. "It's not a crisis, it's early season. It wasn't a crisis for Blackpool that they were bottom of the league after nine games, they've got a new team as well. "Everyone's sort of jostling for positions and if you win three games, you're in the top six."